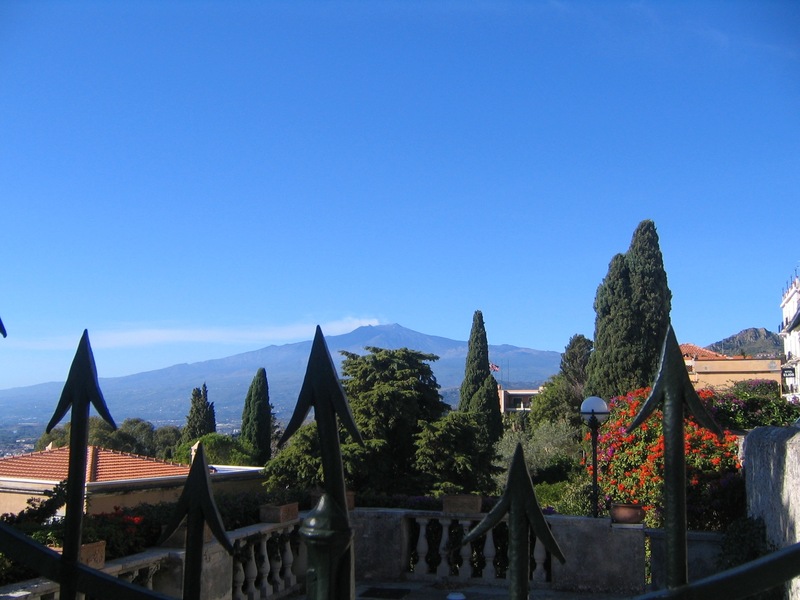 I have just come back from a week in Sicily, in the shadow of Mount Etna (see photo at left) so this seemed like a good time to have a look at Sicily’s contribution to Italian literature. There are various well-known Italian writers that you might have not been aware that were, in fact, Sicilian, not least because they left Sicily at a relatively young age. Sicily’s best-known writer, at least best-known as a Sicilian writer rather than as an Italian writer, is undoubtedly Giuseppe Tomasi di Lampedusa. 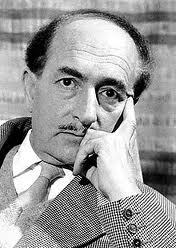 He effectively only wrote one novel but it is now recognised as one of the great Italian novels and as the Great Sicilian Novel. It was also made into a superb film by Luchino Visconti. Its theme is essentially the changes in Italy that occurred in the 1860s (when Italy gained its independence). Italy did not produce many great 19th century novelists as other European countries did but one that they did produce was the Sicilian Giovanni Verga. His novel I Malavoglia, which should be better-known in the English-speaking world (it is in print in both the UK and US), is a Balzacian family saga that is full of misery but well worth reading. Luigi Capuana is not as well-known but is another worthwhile 19th century Sicilian novelist (and poet and dramatist and critic) though very little of his work is available in English. 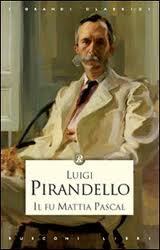 Luigi Pirandello is not a writer that many people associate with Sicily, not least because he spent most of his adult life outside Sicily, but he was born in Sicily. Though best known as a playwright, particularly for Sei personaggi in cerca d’autore (Six Characters in Search of an Author), he did write some novels including the excellent Il fu Mattia Pascal (The late Mattia Pascal) and was and is a major influence on many writers. Pirandello was born in Agrigento in Sicily as was the writer who may be the best-known living Italian writer in the English-speaking world, Andrea Camilleri. Camilleri writes detective novels, often using Sicilian dialect, featuring the cantankerous Sicilian detective, Inspector Montalbano. 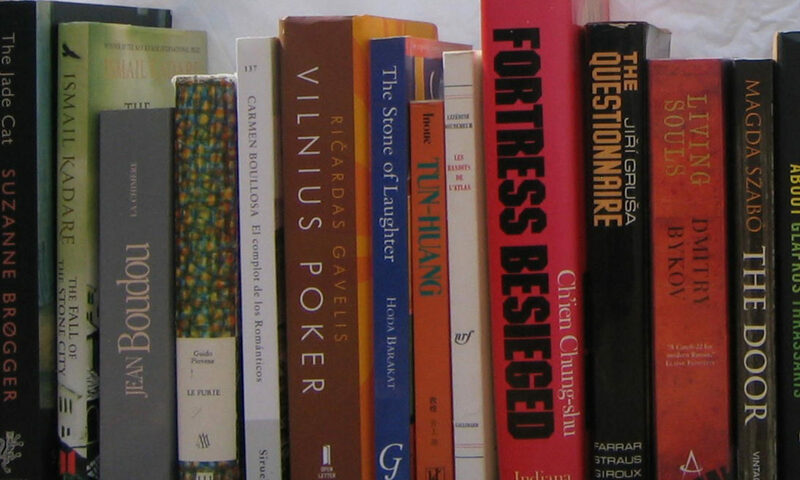 Many of these works have been translated into English and have had considerable success throughout the world. 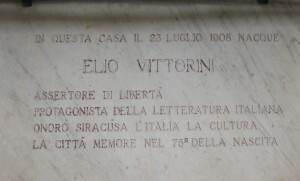 Elio Vittorini was born in Siracusa. Wandering through the streets of Siracusa last week, I came across his birth place, completely unaware that he had been born in the city (see plaque at left – the house is distinctly shabby). As with other Sicilians, then and now, he spent most of his life elsewhere in Italy. Conversazione in Sicilia (Conversation in Sicily; In Sicily; Tears and Wine) is set substantially in Sicily and is a wonderful novel. If you watch this YouTube clip you will see the wedding of Michael Corleone (Al Pacino) in the film The Godfather. The church is in Sávoca, shown in my not very good photo at the right. 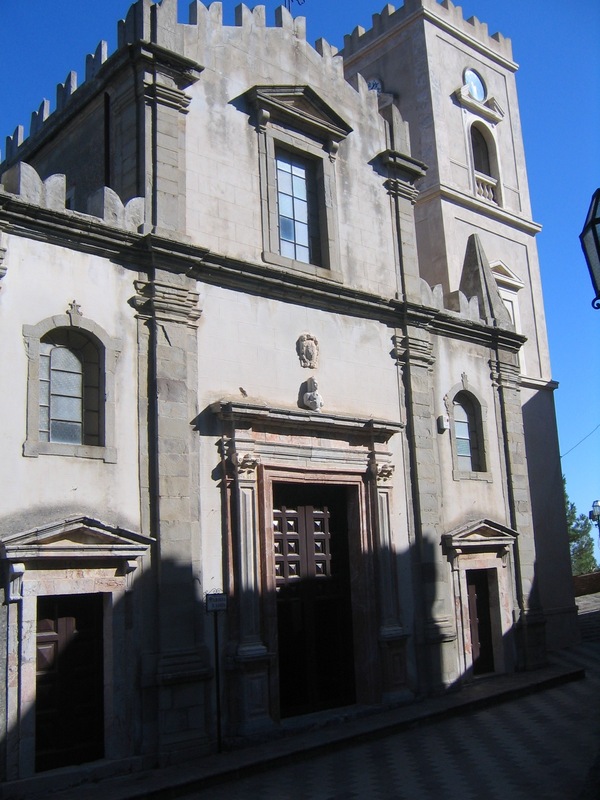 When we returned from Sicily, everyone asked us about the Mafia (we think we saw a mafioso at the bar in Sávoca.). While The Godfather may be the best known Mafia novel/film, the best-known Italian writer on the subject is Leonardo Sciascia. 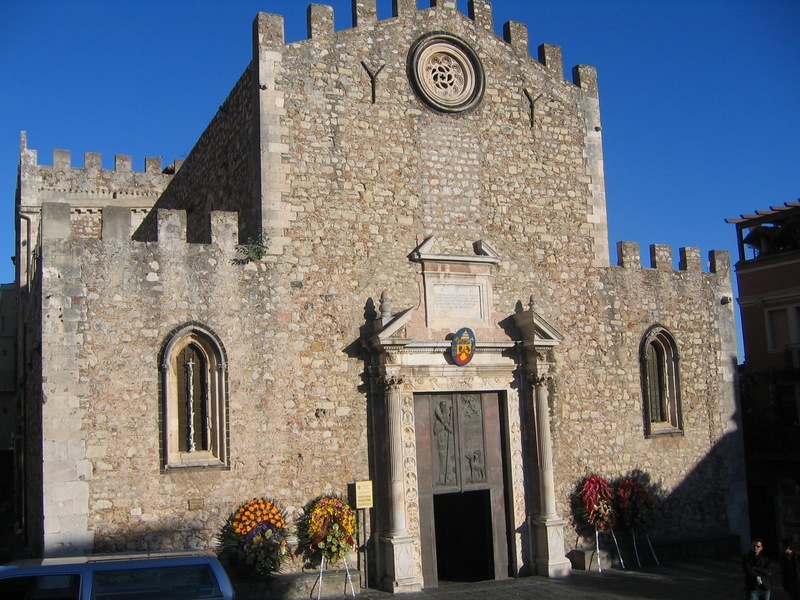 He wrote extensively on the subject, particularly the connection between the Mafia and local politicians, including several excellent novels, quite a few of which have been translated into English. Danilo Dolci is a poet but best known for his anti-Mafia activities and writing. 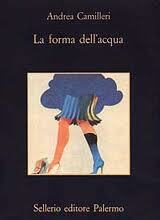 Sebastiano Addamo has not been translated into English (though there are a couple of his books in French). He was a poet and novelist, who wrote about the unpleasant side of Sicilian life. Giuseppe Bonaviri was a prolific poet and novelist, writing about his village and the magic of nature. Vitaliano Brancati, a novelist, scriptwriter and playwright, was initially a Fascist but, under the influence of other Italian writers, when he moved away from Sicily, he modified his position. 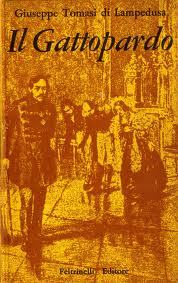 Two of his novels are available in English, including this one. Gesualdo Bufalino was a prolific writer of novels, poetry and books on Sicily, best known for Diceria dell’Untore (UK: Plague-Spreader’s Tale; US: The Plague-Sower), a book which has been compared to Der Zauberberg (The Magic Mountain) with its story of a man in a sanatorium suffering from TB. It is available in English and well worth reading. Lara Cardella attacked the old-fashioned nature of Sicilian society in her book Volevo i pantaloni, translated as Good Girls Don’t Wear Trousers (the Italian means I Wanted the Trousers – I never understand why publishers mess around with titles the way they do). Vincenzo Consolo‘s Il sorriso dell’ignoto marinaio (The Smile of the Unknown Mariner) is a first-class Sicilian novel which is available in English and should be better known. Like many Sicilian writers, he does not live in Sicily. This list is short on women writers but Maria Rosa Cutrufelli, a keen feminist, will certainly fill the gap. Two of her novels – she has also written several works of non-fiction – are available in English and are well worth reading. Livia De Stefani came from an old Sicilian family and, like Lampedusa, wrote her novel about changing ways, with a good bit of Mafia thrown in. It is called La vigna di uve nere and has been translated into English as The Vine of Dark Grapes. She was also an accomplished poet. Dacia Maraini was born in Fiesole (near Florence) of a Florentine father. However, her mother was a Sicilian princess and her best-known novel was about a Sicilian duchess, so she definitely belongs here. There are many more Sicilian writers to explore, sadly relatively few of them available in English but I shall conclude with D. H. Lawrence. Lawrence spent some time in Taormina and allegedly Lady Chatterley was based on an English woman living in Taormina. Lawrence described Taormina as one long parade of junk shops…things dearer than ever, more faked, food tiresome as it always was. If only Etna would send down 60,000,000 tons of boiling lava over the place and cauterise it away. 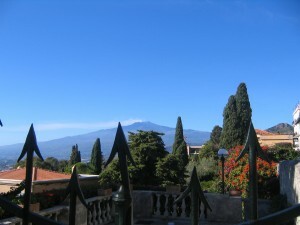 We stayed in Taormina and that was not our experience and Etna did not send down any lava on us. Poor Lawrence. A dismal man. I was reading Javier Marias’s book ‘Written Lives’ & Lampedusa’s name being one of the writers mentioned & one I am intrigued by caused me through curiosity to check out Sicilian authors. That’s how I found my way here & am very pleased you have supplied me with photo’s & invaluable information. You have done all the hard work & I truly appreciate it. s a writer and someone who has lived for a long time in Sicily, I really do have to remark on your assumption of D.H.Lawrence’s character.. He celebrated life, nature and love. Just read his poem SNAKE written while he lived in Taormina. Some local journalist invented the theory of Lady Chatterley’s lover being based on an Englishwoman in Sicily. Get your facts right is what I have always been told as a journalist. I did say “allegedly” regarding the origins of Lady Chatterley and linked to another site which makes this allegation. My facts – that there was this allegation and that it is still around – are therefore correct. I find Lawrence a terribly overrated writer; obviously many people, of which you are obviously one, disagree. That is fine. Life would be boring if we all liked the same writers. Thanks for stopping by. This is a great list – thanks. I’m looking forward to getting to know a few of these authors I don’t know at all as well as having another look at some I do. 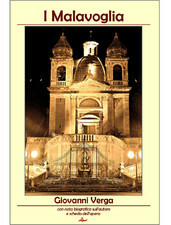 I did not know, for example, that Bufalino was Sicilian – his Menzogne della note (Lies of the Night) is a terrific book. Another writer to add (and to help remedy the shortage of women writers on the list) is Goliarda Sapienza. Her chef d’oeuvre – L’arte della gioia (The Art of Joy) – just came out in English translation last year. It has some riveting scenes of rural life in Sicily, especially in the first chapter concerning the main character’s childhood. Thanks for your comments. I should have remembered Sapienza. I have a copy of L’arte della gioia, which is on my long list of italian books to read. I am looking for a book by Leonardo Sciascia and Anna Sciascia written about Sicilians. That is all I know about it. Do you have any knowledge of these writers or the name of the book(s) they may have written? Arte e politica dopo il ’22 : il Selvaggio. Neither has been translated into another language.